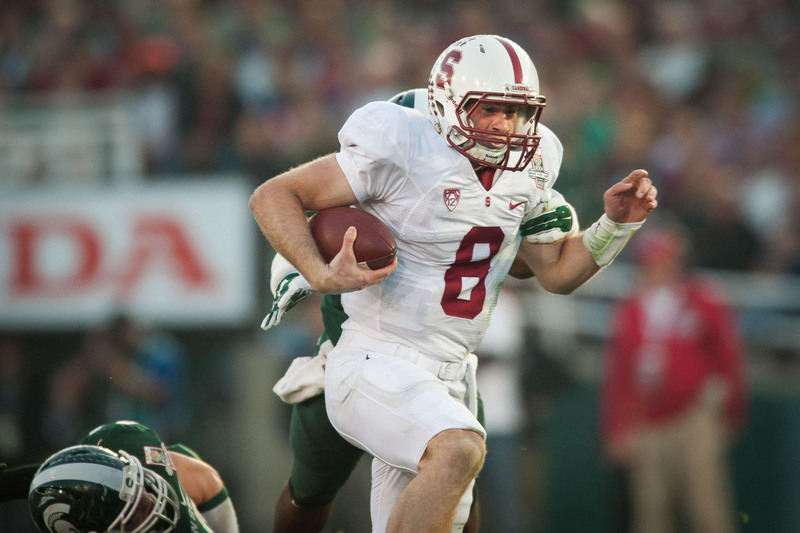 Senior quarterback Kevin Hogan has been, in many ways, a living paradox. So far in his collegiate career, Hogan ranks second in both completion percentage and passer rating in school history, is the first Stanford quarterback to play in back-to-back Rose Bowl Games in the modern football era and has more wins through his first 19 games than Andrew Luck did. Oh, and he’s knocked off Oregon twice — once at Autzen Stadium, where he began the game 12-of-13 passing — in addition to beating 10 ranked teams. But there’s a different side of Hogan that fans saw for the first time last season. Hogan had one of the worst performances in his career against Washington, suffered his first career loss against unranked Utah, looked flat-out rattled for most of the USC game en route to throwing two costly interceptions and disappeared after the first quarter in the 100th Rose Bowl Game. The question surrounding Hogan today is the same question fans posed entering last season: How big of a leap has Hogan made between New Year’s Day and the season opener? It’s no secret that much of Stanford’s success this year will depend on the senior under center — his quality of play, especially on the road, may be the difference between 7-5 and 10-2 for the Cardinal. So given his ups and downs last year, does improving for Hogan just mean being more consistent? Yes, but it’s a different type of consistency than you might think, according to head coach David Shaw. Shaw is right — Hogan was Jekyll much more often than he was Hyde last year. Even in games where Hogan struggled, he still showed flashes of brilliance. Hogan threw two incompletions at the goal line in the final seconds of the loss to Utah, but before falling just short he was 5-of-5 passing and making NFL-type throws on the same drive. Against USC, which might have been his worst game last season, Hogan delivered a perfect long ball on the opening drive that was dropped by Ty Montgomery — a drop that changed the complexion of the game entirely. And in the Rose Bowl Game, Hogan came out poised before Shaw took the reins of the offense away from him. For Hogan last year, the goal was to feel more comfortable with the offense. This season, the goal is mastering the offense, because just being comfortable won’t be enough to overcome Stanford’s brutal schedule. Both Shaw and quarterbacks and wide receivers coach Tavita Pritchard feel confident in Hogan’s ownership of the unit — Hogan’s teammates evidently do as well, as he was elected as one of the team’s four co-captains last week. As one of the bigger steps that he’s taking, Hogan is working on improving his ability to read defenses prior to the snap, a skill that Luck mastered and allowed him to make last-second strategic audibles at the line of scrimmage. In addition to upping his mental game, Hogan also made some changes to his throwing mechanics, specifically releasing the ball at a higher point and avoiding the side-arm motion. Hogan hopes this adjustment will improve his accuracy in the short and intermediate passing game, an area that he recognized the offense struggled with last year. Shaw has received his fair share of criticism for neither putting enough trust in Hogan nor allowing him to make plays, be it with his arm or legs. While the statistics can’t prove whether that criticism carries any validity or not, they do reflect the fact that Hogan was actually given fewer chances with his arm in 2013 (21.07 attempts per game) than in 2012 (25.17). In his last season at Stanford, Luck averaged 31.08 pass attempts per game. And when it comes to checking into a different play at the line of scrimmage, the leash for Hogan has also been considerably shorter than it was for Luck, though that’s expected to a degree. On the Farm, the wide receiver corps is better than ever, five running backs are in the stable, a new trio of sophomore tight ends is ready to step up and one of the greatest O-line classes in modern football history will be on the field. With three days left before the Cardinal’s 2014 campaign begins, the Stanford offense could be one of the best cars in the country. Hogan just needs to prove that he’s ready for the keys. Contact George Chen at gchen15 ‘at’ stanford.edu.